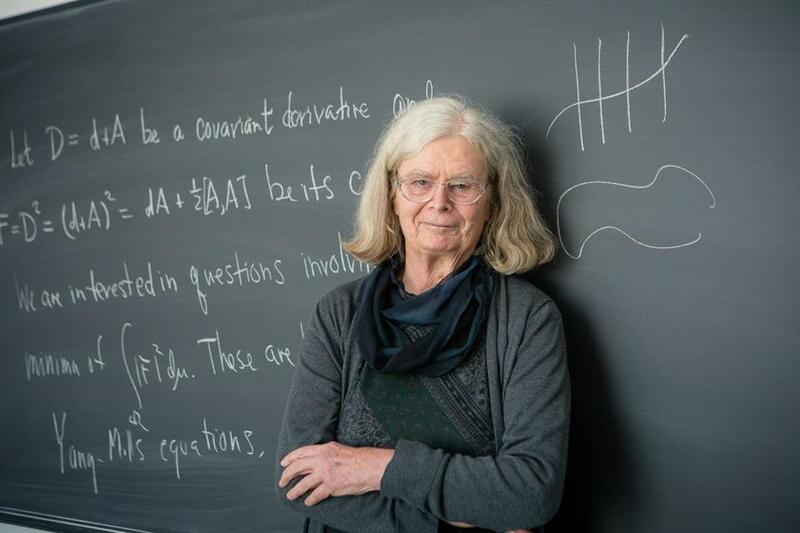 Karen Uhlenbeck on Tuesday received the Norwegian Academy of Science and Letters 2019 Abel Prize in mathematics. NEW YORK — For the first time, one of the top prizes in mathematics has been given to a woman. One of Uhlenbeck’s advances in essence described the complex shapes of soap films not in a bubble bath but in abstract, high-dimensional curved spaces. In later work, she helped put a rigorous mathematical underpinning to techniques widely used by physicists in quantum field theory to describe fundamental interactions between particles and forces. Uhlenbeck, who lives in Princeton, learned that she had been awarded the prize Sunday morning. Uhlenbeck, 76, a visiting associate at the Institute for Advanced Study in Princeton, said she had not decided what to do with the $700,000 that accompanies the honor. The Abel, named after Norwegian mathematician Niels Hendrik Abel, is set up more like the Nobels. Since 2003, it has been given out annually to highlight important advances in mathematics. In her early work, Uhlenbeck essentially figured out the shape of soap films in higher-dimensional curved spaces. This is an example of what mathematicians call optimization problems, which are often very difficult and can have zero solutions, one solution, or many solutions. To minimize the forces of surface tension, a bubble forms in the shape with the least amount of area to wrap around a given volume — a sphere. When two or more bubbles touch each other or when a soap film forms inside of a twisted metal loop, the shapes become more complicated but still contorts to take up the smallest amount of area. In yet higher dimensions, “The theory becomes dramatically harder, and standard techniques just don’t work,” said Dan Knopf, who worked with Uhlenbeck at the University of Texas. Uhlenbeck showed that the problem was not unsolvable everywhere, although at a finite number of points, the calculations would not converge. Thus, one could get a handle on the answer by handling those troublesome points separately. Uhlenbeck later worked on what are called gauge theories, used by physicists in quantum field theory to describe interactions of subatomic particles. A gauge theory basically says that how the particles behave should not change depending on how you look at it. That is, the laws of physics should not change if the experiment is moved to the left or rotated. Uhlenbeck began publishing her major papers in her late 30s. In principle, that would have been early enough that she could have been recognized with a Fields Medal, but her ideas took time to spread. In 1983, at 41, she received broader recognition with a MacArthur Fellowship, which comes with a bundle of money — $204,000 in Uhlenbeck’s case. “That was almost more unnerving” than being the first woman to receive an Abel, Uhlenbeck said. Uhlenbeck said she recognized that she was a role model for women who followed her in mathematics.